We report a case of potentially fatal cervical necrotizing fasciitis and descending necrotizing mediastinitis due to deep neck infection in a 66-year-old male patient with no history or evidence of immunocompromising disorders. On admission, he had painful neck movements and the skin over his neck was red, hot and tender. 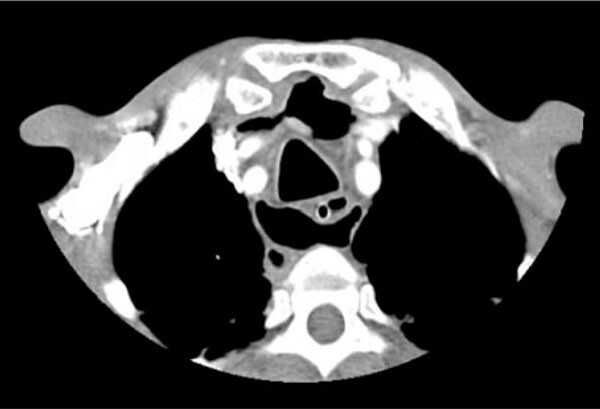 A computerized tomography (CT) scan of his neck and chest showed evidence of air collection in soft tissues. He was treated with broad-spectrum intravenous antibiotics and early massive cervical drainage. Prompt diagnosis by CT of the neck and chest enabled an early surgical treatment of cervical necrotizing fasciitis. Although acute mediastinitis is a fatal infection involving the connective tissues that fill the interpleural spaces and surround the median thoracic organs, an extensive cervicotomy combined with appropriate antibiotics can prevent the need for mediastinal drainage. Descriviamo il caso di una fascite cervicale necrotizzante potenzialmente fatale con mediastinite necrotizzante discendente causata da un’infezione profonda del collo in un maschio di 66 anni, in assenza di anamnesi o evidenza di patologie immunodepressive. All’ingresso presentava dolore al movimento del collo e la cute del collo era arrossata, calda e dolente. Una TAC di collo e torace mostrava enfisema nei tessuti molli. È stato trattato con antibiotici ad ampio spettro e.v. e drenaggio cervicale massivo precoce. Una diagnosi tempestiva con una TAC del collo e del torace ha consentito un trattamento chirurgico precoce della fascite necrotizzante cervicale. Nonostante la mediastinite acuta sia un’infezione fatale che interessa il tessuto connettivo interposto tra i foglietti pleurici e che circonda gli organi mesotoracici, una cervicotomia estensiva associata ad un’adeguata terapia antibiotica può prevenire la necessità di un drenaggio mediastinico. Cervical necrotizing fasciitis (CNF) is an aggressive and life-threatening deep neck infection. It is characterised by a fast-spreading soft-tissue infection resulting in propagation of necrosis starting with less vascularised tissues such as fasciae, and progressively extending to neighbouring tissues, mainly affecting cervical fat and muscle . The deep cervical fascia is composed of 3 layers (superficial/pretracheal, retrovisceral, and prevertebral/alar), dividing the neck into 3 regions. 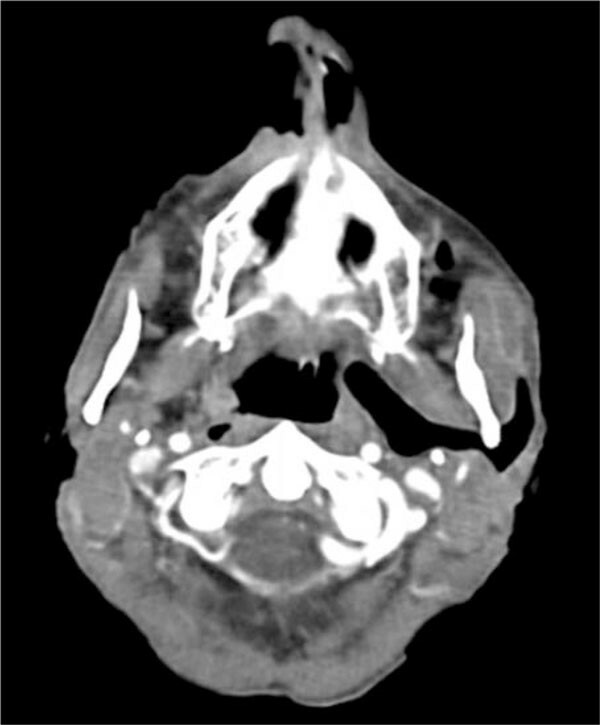 The retropharyngeal space accounts for 70% of cases of descending necrotizing mediastinitis (DNM). It lies behind the esophagus (the visceral layer of deep cervical fascia) and anterior to the prevertebral fascia, extending from the base of the skull to the posterior mediastinum . A healthy, 66-year-old male was admitted with a 3-day history of cervical pain, chest pain, and fever. The patient presented with a lower cervical abscess upon physical examination. A cervicothoracic computerized tomography (CT) showed collection of air in the left oropharyngeal (Figure 1), pretracheal, and retrotracheal (Figure 2) regions, and pneumonic infiltration in the right lung fields (Figure 3). A diagnosis of cervical necrotizing fasciitis (CNF) associated with descending necrotizing mediastinitis (DNM) was based on clinical and computed tomography findings. The patient was admitted to the intensive care unit for invasive monitoring and fluid and electrolyte resuscitation. Microbiological analysis of pus revealed Prevotella melaninogenica and Veillonella spp. Intravenous antibiotic therapy consisted of teicoplanin (200 mg/day), ertapenem (1 g/day), and metronidazole (1 g/day). Then, the patient underwent cervicotomy for CNF. Dressing changes and irrigation with povidone-iodine and normal saline through the drains were performed twice daily until clear fluid was produced for 72 h; drains were then removed. There was no recurrence during long-term follow up evaluation. At oropharyngeal level, a giant air collection on the left side. Pretracheal and retrotracheal gas bubbles at the level of the manubrium. Pneumonic infiltration in the right upper lobe with mediastinal air. The incidence of DNM in patients with deep neck infections is 1.5-3.6% . Clinically, there are two distinct forms of CNF: suppurative (characterised by purulent fluid collection) and gaseous (characterised by gas formation) . We described a gaseous form of the disease caused by Prevotella melaninogenica and Veillonella spp. Another patient presenting with DNM due to Peptostreptococcus and Prevotella species died from progressive multiple organ failure attributable to sepsis . There is only one study in the literature reporting Veillonella spp. as a causative organism in DNM, but the disease appeared in an immunosuppressive patient . Our patient was not in an immune-compromised state such as diabetes mellitus, obesity, alcoholism, renal/hepatic failure, or chronic cortico steroid intake. The patient presented with poor dental health, but had no other predisposing factors such as trauma or the administration of non-steroid anti-inflammatory drugs. It has been reported that cervicomediastinal drainage and antibiotic therapy is insufficient in the management of DNM, once the abscess has extended to a level below the tracheal bifurcation . 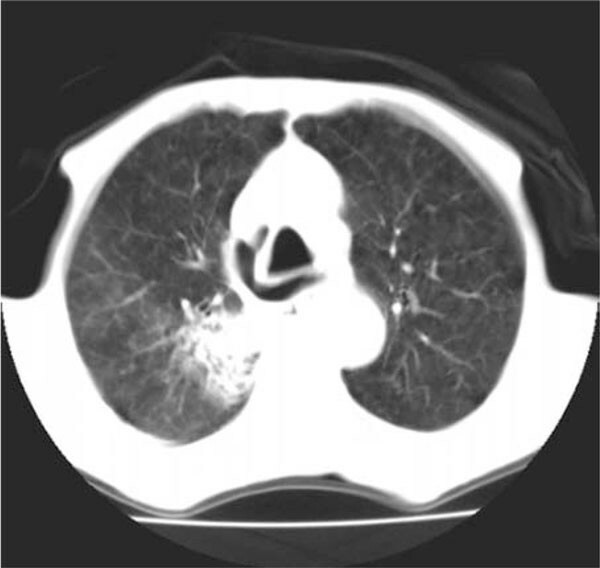 Since mediastinal involvement was restricted above the fourth thoracic vertebra in our patient, a cervicotomy combined with systemic antibiotic therapy was successful in eradicating the infection. Treatment options for CNF with DNM include airway management, prompt surgical drainage and antibiotic therapy [1–6]. Hyperbaric oxygen therapy is believed to limit the extent and number of surgical debridement procedures and reduce the mortality rate associated with necrotizing fasciitis, but the authors did not use hyperbaric oxygen because the published results remain inconclusive . Prompt diagnosis and early surgical treatment (extensive cervicotomy) combined with appropriate antibiotic therapy are essential for reducing mortality in CNF/DNM. This approach can prevent the need for a sternotomy or thoracotomy in spite of concomitant pulmonary involvement. Emergency physicians need to be familiar with this rare but lethal disease.